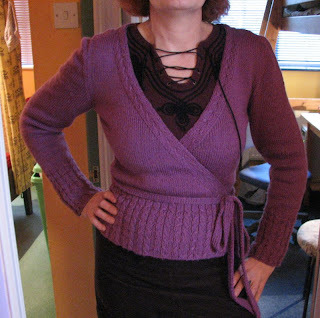 I finished sewing up on Wednesday evening, and wore it to work the very next day! And it looks great with jeans too! Wow! It looks fantastic! I love the color and it fits wonderfully. Great job! Whoa-you knit, like, lightening fast. Must be your superpower. Looks fab-oo. Great job. It's beautiful! Ok, this gives me hope... I'm madly trying to finish mine to wear next Sunday... just finishing the front tonight and all that's left is sleeves and ties... yours inspires me to go knitknitknit!! !